Residents of Kerala are sincerely entrenched to their traditional legacy. Perhaps, this is why even the wave of modernization has not been able to scoop up the rich culture of customs and ethnicities. Music and dance moreover form an essential part of the life of Keralese ever since a long time. Classical along with the folk music and dance have kept flourishing the ancient allures and stories which still find varied audience amongst travellers of Kerala. Over 2000 years back, Muni Bharata wrote the Natya Shastra (The Science of Acting), which turned into the academic standard for classical dance, theatre, music, get-ups, make up and the visual arts of India. Kathakali also pulls its enticement from the temple customs and prior forms of classical drama to embrace Kootha, Koodiyattam, Krishnanattam and numerous folk arts. The exemplary stories were memorised by the Brahmin priests then passed, unaffected, to the next generation, confirming that the divine meaning was conserved. Although, Kings who governed the area, had supremacy, played a vigorous role in shielding these stories, teachings, law and divine development. As the Brahmins moved and established in several parts of the country their stories withart, music, and literature went with them. How To Performing Kathakali Dance? Conventionally, Kathakali used to be performed night onwards and would end in the early morning but the modern form of the dance lasts a minimum of 3 hours. The actors dress up in the traditional masks, colourful costumes and head dresses with painted faces and the dance is performed in front of a lamp known as Kalivilakku. Historically, the purpose of lighting this lamp was to provide sole light when the performance was inside temples or palaces or the abodes of aristocrats. The play is enacted with music known as Manipravalam and the traditional instruments. The major percussion instruments used with the performance are chenda, maddalam and edakka. The singers use ilathalam and chengila which is a gong made of bell metal. The dance is formed with hand gestures, expressions and rhythmic dancing without any dialogues. Originally, the 3 major styles of Kathakali were Vettathu Sampradayam, Kalladikkodan Sampradyam and Kaplingadu Sampradayam. But these styles then narrowed down to northern and southern styles. The difference in these styles is based on their subtleties like choreographic profile, stress on dance vs. drama and position of hand gestures. The northern style is implemented in the Kerala Kalamandalam. The southern styleis known for its stress on drama and the part-realistic techniques and is implemented in the Margi. A mix of both these styles is created in Kalanilayam. A major art and culture university, the Kerala Kalamandalam was founded by renowned poet Padmabhooshan Vallathol Narayana Menon and Mukunda Raja in 1930. Kalamandalam is a residential university and has some of the veteran teachers who participate in the art-recitals, demonstrations and workshops. The Ernakulum Karayogam Club is a very popular social and cultural location in Kochi. Established in 1925, the club has a rich history and culture. The Kathakali club performs great enactments that are widely popular and appreciated by the audiences. The Kerala Kathakali centre is established in 1990 and popularly known as the School of Traditional & cultural arts. This is also Kerala’s leading arts school in Kochi. It claims to be the only authentic theatre where Kathakali, traditional arts, martial arts and other culture dance forms of Kerala are demonstrated in its traditional style. This theatre specialises in the dance forms and martial arts forms of the traditional Kathakali and Kalaripayattu respectively. It has regular Kathakali shows that are enjoyed by the ardent fans of the dance form. Kathakali is not just a dance form but the legacy and culture of Kerala entrenched in one. 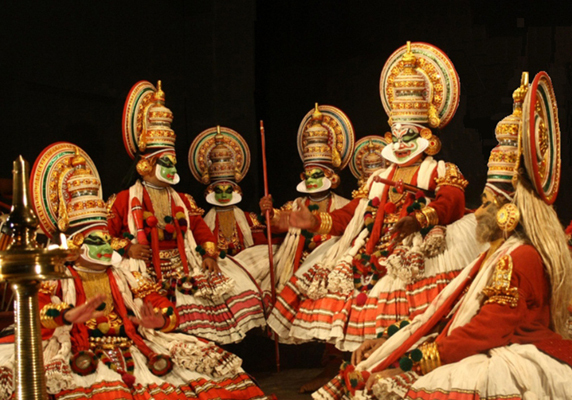 It showcases the rich culture of Kerala and is the most rooted dance form that is worth enjoying once in a lifetime. So the next time you visit Kerala, do not miss out on this most intoxicating and traditional dance of the state. Do you want to see this classical dance in Kerala? Book your Kerala tour package at lowest fare.